Cara has had horses all her life at 16 left school and did a years training at Snainton riding centre gaining my BHS stage 3, then started at Bishop Burton College gaining her BHS AI, Advanced National diploma in equine and business studies and then an HND in equine and business, while there was chosen to compete on all university riding teams. Also gained valuable experience working for International event rider Paddy Muir and Olympic dressage rider Laura Fry. Competition experience started at pony club level competing at the national championships 3 years in a row in all 3 disciplines and been placed, now successfully competing a string of horses to intermediate and CCI* 3 day level British eventing and Advanced level British dressage. Has also shown at county level qualifiying for RIHS in middle weight show hunter two years in a row. In 2009 Cara gained her ITEC diploma in Equine sports massage after training with NewZeland team Physio Mary Bromiley. Was Chief instructor for her local pony club, and has private clients who are competing sucessfully at affiliated and unaffiliated level. Qualifed for winter national championships on Detonator adv med freestyle. Regionals 3rd Sandonista Elem freestyle and 2nd Detonator adv med freestyle and 3rd PSG. Selected to compete for Great Britain at small tour level Keysoe CDI** Detonator. July selected to compete with Detonator at small tour level for Great Britain at the Hartpury CDI placed 14th overall. October selected for Great Britain to compete at Le Mans in France with Detonator. Summer regionals Detonator 2nd Inter 1 and 4th PSG. Sandonisa 6th Novice and 9th Elem. WINNER PETPLAN INTER 1 FINALS riding detonator. Sandonista qualified for winter championships novice open freestyle. 6 top ten finishes at the winter regionals, Detonator gaining two 3rd places and Sandonista gaining a 73% in the novice open freestyle gaining a wild card for the Winter Nationals. Advanced Medium restricted Regional Champion at the winter regionals on Detonator, also 6th on Rhythmic Times. Winner Sheepgate Petplan PSG and Inter 1. Selected to compete at the home International on Detonator at PSG level coming 3rd. 2nd Avanced Medium Restricted summer regionals Detonator. 6th Novice open summer regionals Sandonista. 3rd in the Medium open freestyle and 4th Adv Med freestyle winter regionals. Qualified for the Winter Championships Adv Med restricted and Avanced Medium Freestyle. SPONSORED BY HORSLYX AGAIN FOR 2015. I am now a HORSLYX ambasador, this is for the whole of 2014 promoting their brilliant products. Winner Home International on Detonator at Advanced Medium level. 3rd at the summer regionals on Detonator at advanced medium level and 9th at medium open level. Winner of the petplan area festival advanced medium on Rhythmic Times, qualifiying for the finals, report in Horse and Hound. 3rd winter regionals medium open and qualified for the winter championships and 5th in the elementary freestyle with Detonator and 10th adv medium freestyle Rhythmic Times. 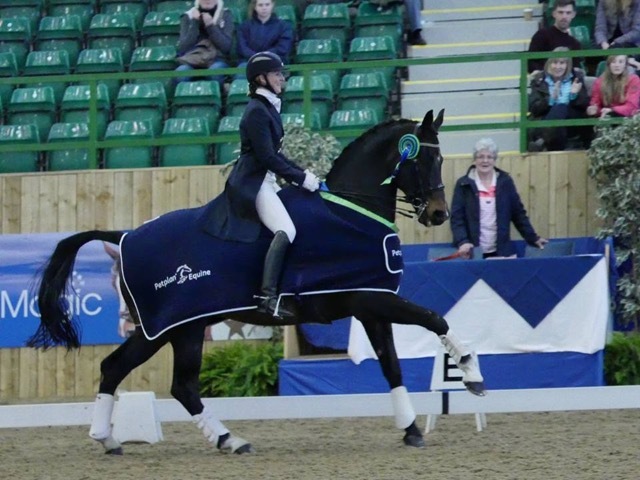 WINNER OF THE BRITISH DRESSAGE HOME INTERNATIONAL MEDIUM LEVEL. Reserve champion with Detonator at the Petplan Elementry Open finals Hartpury. Winner of the Pet Plan area festival Medium Open. 5th Elementry open regional finals. 5th place on DETONATOR at the Area Festival Elementary finals at Hartbpury's British Dressage winter championships. Member of the Northern and England team placed 4th at the Home Internationals and 9th Individualy at Elementry level riding Detonator. Was picked for the Northern team and England to compete at the senior home internationals with her 5 year old Detonator II and won one of the classes.